A new report conducted by the Okigin Economic Research Institute looks at the economic impact of the Okinawa Institute of Science and Technology Graduate University (OIST) on Okinawa and Japan. The report was commissioned by OIST and includes analysis of the university’s economic activity over fiscal year 2017 (April 2017-March 2018). In said year, the university generated an estimated ¥228 for Japan’s domestic economy for every ¥100 OIST received. Most of that production impacted the Okinawa Prefecture, generating ¥163 for every ¥100 in input. Read the executive summary and the full report here. The report utilized a method of economic analysis introduced in 2007 by Japan’s Ministry of Education, Culture, Sports, Science and Technology (MEXT). MEXT reported the outcome of a study to evaluate the economic impact of regional universities on their local communities.1 The report validated the use of interindustry analysis, so-called “input-output” analysis, to measure economic effects as a way to quantify economic impact. This type of analysis, used in the current study, measures the economic “ripple” effects under the premise that university activities produce primary and secondary demands in the region. Consumption gives rise to intermediate demands which lead to increased production. Increased production leads to increased income which further leads to more consumption and new production. The calculations used in this study looked at these contributions and the total effect was calculated. The detailed report divvied the contributions into four categories: education and research activities; faculty and student spending; construction; and other activities, including spending by OIST workshop participants and other visitors to the university. Most of OIST’s funding arises from generous subsidies from the Japanese Government, and the impact report traces how that money flows back into the domestic economy after being used by the university. Economic impact was calculated by looking at induced production, employment and tax revenue. Input-output tables for Japan available from fiscal year 2011 were used to calculate the different types of ripple effects that can impact the economy. Similar data from the Okinawan Prefectural Government were used to estimate the contribution to Okinawa. Commerce, housing-related industries, and service industries were most impacted by OIST economic activities. In 2017, OIST spent an estimated ¥10.53 billion for education and research activities. These activities put ¥16.972 billion back into the Okinawan economy and a total of ¥24.171 billion into the Japanese domestic economy. Faculty and student spending brought ¥5.938 billion in input to Japan and ¥5.853 to Okinawa. The spending induced ¥12.937 billion worth of production in Japan, ¥9.662 billion of which was generated in Okinawa. ¥1.477 billion went to the construction of Laboratory 4, the on-campus Child Development Center, and other facilities, which generated ¥2.432 billion in induced production. ¥912 million were put into other activities, which produced ¥1.575 billion in Okinawa and ¥2.056 billion in the nation overall. The economic analysis also projected into the future by assessing the impact OIST will have once it grows to 100 faculty members. OIST currently plays host to 67 international faculty members with expertise in a wide range of scientific disciplines. Each additional faculty member establishes their own research unit, attracting a new cohort of students and postdoctoral scholars to campus. In fiscal year 2017, OIST had 61 faculty, 170 students, and 832 executives and staff, combined, generating 2,902 jobs in Okinawa and 4,047 jobs in Japan, overall. By the time the university reaches 100 faculty, it is anticipated to create an additional 2,500 and 1,800 jobs in Okinawa and Japan, respectively. In the fiscal year that OIST reaches 100 faculty, input to education and research activities is projected to reach ¥17.262 billion; faculty and student spending, ¥9.66 billion; construction, ¥2.563 billion; and other activities, ¥1.364 billion. The induced production from each is projected to reach a total of ¥39.625 billion, ¥19.616 billion, ¥6.737 billion, and ¥3.073 billion, respectively. For Okinawa Prefecture, the estimated inputs are the same, with the exception of faculty and student spending at ¥9.572 billion. Production is estimated at ¥27.823 billion, ¥14.776 billion, ¥4.213 billion, and ¥2.354 billion, respectively. 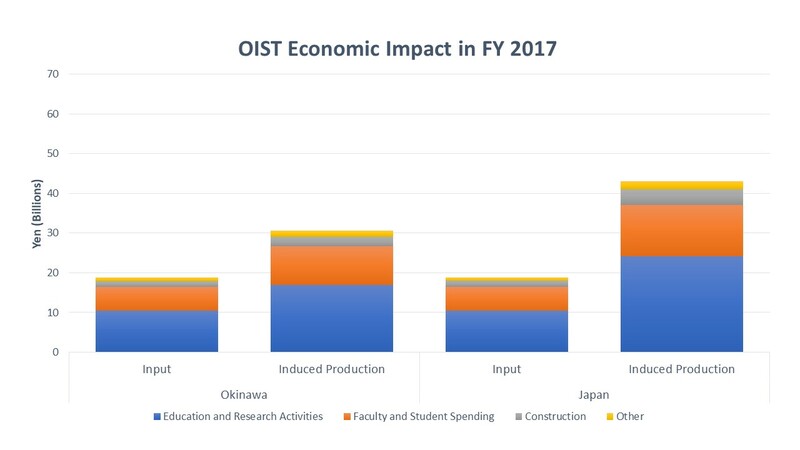 As the university continues to grow, the economic impact of OIST should continue to increase, providing further benefits for Okinawa, Japan and beyond.